Flatfoot is common in both children and adults. When this deformity occurs in children, it is referred to as “pediatric flatfoot.” Although there are various forms of flatfoot, they all share one characteristic – partial or total collapse of the arch. 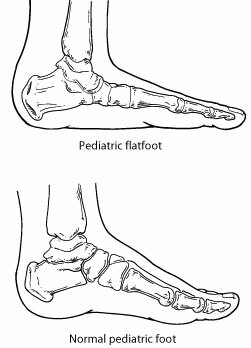 Pediatric flatfoot can be classified as symptomatic or asymptomatic. Symptomatic flatfeet exhibit symptoms such as pain and limitation of activity, while asymptomatic flatfeet show no symptoms. These classifications can assist your foot and ankle surgeon in determining an appropriate treatment plan. 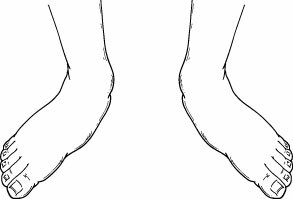 In diagnosing flatfoot, the foot and ankle surgeon examines the foot and observes how it looks when the child stands and sits. The surgeon also observes how the child walks and evaluates the range of motion of the foot. Because flatfoot is sometimes related to problems in the leg, the surgeon may also examine the knee and hip. X-rays are often taken to determine the severity of the deformity. Sometimes additional imaging and other tests are ordered. If a child has no symptoms, treatment is often not required. Instead, the condition will be observed and re-evaluated periodically by the foot and ankle surgeon. Custom orthotic devices may be considered for some cases of asymptomatic flatfoot. Activity modifications. The child needs to temporarily decrease activities that bring pain as well as avoid prolonged walking or standing. Orthotic devices. The foot and ankle surgeon can provide custom orthotic devices that fit inside the shoe to support the structure of the foot and improve function. Physical therapy. Stretching exercises, supervised by the foot and ankle surgeon or a physical therapist, provide relief in some cases of flatfoot. Medications. Nonsteroidal anti-inflammatory drugs (NSAIDs), such as ibuprofen, may be recommended to help reduce pain and inflammation. Shoe modifications. The foot and ankle surgeon will advise you on footwear characteristics that are important for the child with flatfoot. In some cases, surgery is necessary to relieve the symptoms and improve foot function. The surgical procedure or combination of procedures selected for your child will depend on his or her type of flatfoot and degree of deformity.